1. SCARCITY: Numismatic coins are, by their nature, becoming harder to find every day. Therefore their value is likely to increase substantially over time. 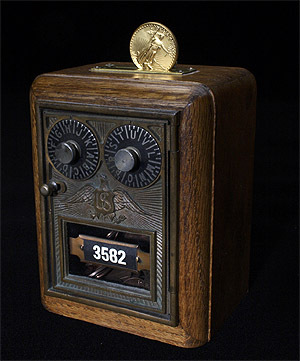 The number of coins originally issued (mintage) is not always an accurate indication of scarcity. It is the interplay of demand with the remaining supply that determines scarcity. Population reports also help indicate monthly changes in a coin's scarcity or "survival" rate. 2. CONDITION: The condition of a coin is one of the key factors in determining value. The grading of a coin is performed under exacting specifications that require specialized training. The recognized specifications of the grade are a decisive factor in the value of a numismatic coin. 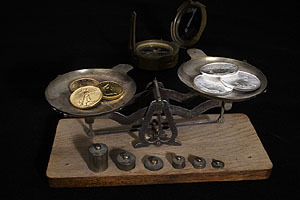 Numismatic experts use a numerical scale from 1 to 70 to describe condition, giving the obverse (front) and reverse (back) of each coin equal examination. 3A. 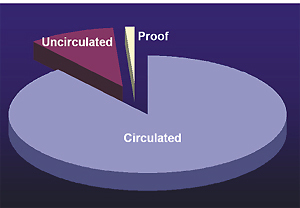 SUPPLY: The degree of collector and investor demand plays a key role in determining a coin's value. Rare coins are no longer minted, so the supply is very limited due to: attrition loss, mishandling, donating collections to museums, hoarding, government melt down and government intervention. 3B. DEMAND: A coin's rarity, historical significance, quality and track record can all influence demand for a coin. Coin collectors often build life-long collections with no immediate intention to sell, whereas investors are more concerned with growth and return. Certified coins are placed into a hermetically sealed, tamper-proof plastic holder with its grade and certification permanently displayed. Is The Price I Paid For Numismatic Coins Fair? ~ Was the price I paid the right price? - How is a coin's real value determined? - What publications provide accurate prices? - Where can I get reliable market information? The Greysheet and The Red Book, although a great help in establishing value, are not the final word. Many coins trade for well above Greysheet and The Red Book -- in some cases, even multiples of the sheet -- and some trade for well below the sheet. The Greysheet gives us a general feel for week-to-week market movement. The Red Book tracks a coin's value from year-to-year. Real Money Perspectives, Swiss America's FREE print and electronic Market News Digest, featuring the top economic stories and commentary, as well as gold and coin market news, since 1982. Another factor in coin pricing is tracking the major coin auctions and the prices realized each week. Then, coin buyers must negotiate with wholesalers almost daily. After all this coin buyers get the feel for what a coin is really worth. You don't need all of these services and reports to determine the value of your coins. However, if you wish to track your progress, or determine if you received value at the time of the purchase, you do need much more than just another dealer's word or questionable opinion. In the coin market, price does not automatically equate to value -- such as a car purchase or buying a six pack of soda. Not all coins are created equal. "Sight-seen" coins are priced differently than "sight-unseen" coins (a coin that is ugly won't sell for the same price as a pretty coin). 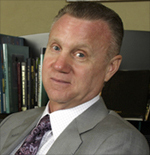 I have traded with well over 40,000 clients in the last 30 years while in the coin business. Here's the bottom line; you get what you pay for. There is no free lunch out there. Don't get me wrong, you may find a similar coin for more or less money, but it won't be the exact same coin. - Does that company that you are comparing have a buy back policy behind it? - Have they been through the ups and downs of the markets? - Was it a "sight-seen" coin that was inspected by three knowledgeable numismatists, or was it looked at by a person who just started in the coin business? - Was it one coin of a group of five in which four others were rejected due to copper spots or other distractions that could keep the coin from having optimal market appeal to future buyers? - Are you truly comparing apples to apples? A rare coin is not a commodity like sugar, wheat or bullion gold. Have you ever seen a 100 oz. bar of gold? Some are ugly and beat up, some are brand new and shiny, but they both trade for the same value. This is not true in the Numismatic coin market. The way a coin looks (known as 'eye appeal') as well as the way it was graded is very important when making your comparisons. Frankly, unless the other dealer has the coin you bought right in front of him, he can't make the comparison correctly. He simply can't see the coin through the telephone. Even if you went to his shop, he probably doesn't have another coin to compare it with that is the exact grade or date. 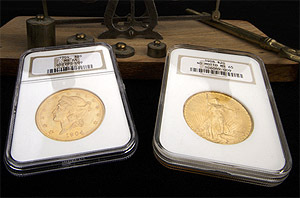 Often, coin shops will try and use another date or grade coin, which then invalidates the comparison. My point is that it's easier for many to believe they made a bad trade than it is for them to believe that they bought a great coin at a fair price. We Americans (and I'm guilty too) always believe a bad report a lot easier than we do a good report. Also, I have personally seen coins from other dealers being compared to Swiss America coins that were down right ugly. In one instance, a coin offered by another dealer had so many copper spots that it sold for 15% below the current Greysheet price. 1. Always buy from a recognized national dealer or broker who has the experience of the ups and downs in the market. (A dealer with a minimum of a 10-year track record). 4. Be sure the dealer offers you a two-way market. Confirm the dealer will not only sell the coins but also provide, in writing, their buy-back policy. Closely examine the buy-back policy. Make sure the buy-back price does not vary on a basis of quantity. Also inquire on the time factor for repayment. Most reputable companies will settle a trade within 72 hours.